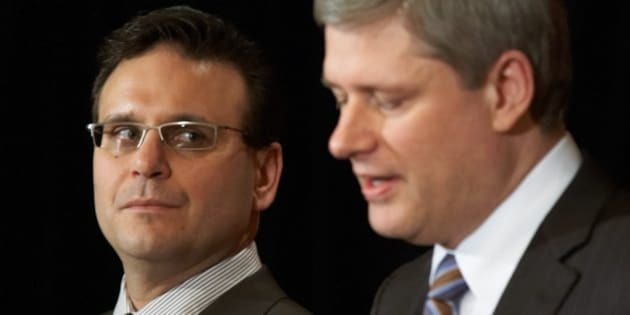 OTTAWA - Quebec's electoral watchdog says that illegal financing of Quebec's now defunct ADQ may have occurred — and the time frame overlaps with Tory Senator Leo Housakos time as chief fundraiser for the provincial party. Meanwhile, the former leader of the ADQ, Gilles Taillon, told The Canadian Press on Tuesday he gave a deposition to Quebec police in 2009 outlining his concerns that the party had been taking in illegal donations in previous years. "In 2009, we were calling for an inquiry into the construction industry, and to clean up political financing. (Party insiders) came back and said to me, be careful what you're saying Gilles, because these things are going on in your own house," said Taillon, who bitterly left his post after only three weeks. "I would have cleaned things up if I had stayed, but since I left I handed it over to the police. At the time, it was a bit strange to go to the police about that, but now I think I was right to do it because today we know what was going on wasn't pretty." Housakos responded by reiterating he did not participate nor did he have any knowledge of wrongdoing while he was the chairman of the ADQ's fundraising arm from 2002 to 2008. He said nobody in any position of authority, including the Quebec provincial police, has ever contacted him for questioning. "I can tell you that all the fundraising we did followed the law, from A to Z, with no exception" he said in an interview Tuesday. The comments come a day after construction boss Lino Zambito told CBC News that Housakos had asked him to make a donation of nearly $30,000 to the ADQ in 2008. At the time, Housakos was also Prime Minister Stephen Harper's appointee on the board of Via Rail. Zambito said the money was collected by asking friends and staff at his firm to write cheques and then reimbursing them. Such a system of "borrowed names" has been described in detail at the Charbonneau inquiry into contract corruption in Quebec. Zambito expressed his suspicion that the senator knew how the money was raised, saying, "They all knew the system. No one's going to make me believe they didn't know what was happening." Housakos said he did not have any knowledge the donors were later being reimbursed. "Throughout that whole interview (Zambito) acknowledged he's the one that did the illegal activity. The only thing he said that was a stretch was 'He must have known, because it was going on all over the place...,"' Housakos said. "What was my participation in illegal activities? I took an envelope full of cheques?" Former ADQ president Mario Dumont had a similar comment Tuesday, saying it would have been impossible for parties to prevent or check for such schemes. "The truth is that you have a cheque in your hands, it comes from a citizen, it's legal. You deposit it, it clears the bank and it's a perfectly legal donation," Dumont told Montreal's 98.5 radio station. "The next week, the person who made the contribution is reimbursed by their boss. The contribution becomes illegal and the political party never knew." A spokesman for Quebec's chief electoral officer says the office has taken interest in cases where it is clear that a party has received significant amounts of "sectoral financing," or money that comes from a single type of business — law, engineering or construction firms, for example. "What we've established is that the ADQ has effectively received $800,000 in sectoral financing, and a part of that might be illegal," said spokesman Denis Dion, referring to a time frame of 2006 to 2011. "It's possible we are investigating, but we can't confirm that." Over the months at the Charbonneau inquiry, different witnesses have raised their contributions to the ADQ. The former president of Genius Conseil said he gave to all political parties in a bid to curry favour, using the same system of borrowed names for contributions as Zambito described. Quebec's elections office calculated the amount Genius gave to the ADQ as $28,700 between 1996 and 2010. Engineering firm BPR is another example of a business that gave generously to the ADQ. Former president Pierre Lavallee testified before the Charbonneau commission that all political parties, including the ADQ, had solicited tens of thousands of dollars from his firm. BPR gave $42,420 to the ADQ between 2006 and 2008. The following year, Lavallee hired the newly named Senator Housakos to work at the company. Lavallee said all the donations from the company were made legally by staff members. In the meantime, Lavallee has admitted to participating in a kickback scheme on municipal contracts in Montreal and resigned from his post. BPR executives were among the engineering consulting firms that bought tickets en masse to a Conservative fundraiser featuring Harper in May 2009. Housakos was one of the key organizers. The fundraiser helped the Laurier Ste-Marie Conservative riding association rake in $288,823, or five times more funds than Harper's riding association of Calgary Southwest that year. "The fact that eight people in an office contribute to a political party doesn't mean that the employer reimbursed those employees, but it gives you a hint," said Dion of Quebec's elections office. "When we see that, it makes us want to go have a look, and maybe eventually lead to an investigation." Housakos describes the ADQ as being a "minnow" among Quebec political parties with minimal support from the construction industry over the years. The party has since been folded into the Coalition Avenir Quebec. "Except for a basically six or seven month period, we were piss poor running on fumes," Housakos said. "In 2005, 2006, 2007, we were raising $100,000 a year, and I can tell you how we were raising that money, penny by penny, dollar by dollar." Other former associates of Housakos are facing charges in connection with contract fraud in Quebec. Former construction boss Tony Accurso faces fraud, breach of trust and corruption charges by Quebec's anti-corruption squad, a range of federal charges in connection with tax evasion, plus hundreds of charges laid by Quebec's tax agency. Accurso told La Presse newspaper in a rare interview a year ago that he has never stolen anything from anyone, and is proud of the company he built. Housakos has publicly called Accurso a great businessman. A telephone conversation purporting to be between Accurso and Housakos was mysteriously posted to YouTube during the 2011 federal election in which the two discuss meeting a developer at Accurso's office. Dumont and Housakos met up by chance with Accurso during a trip to Hawaii and the three families shared meals together, according to Dumont. Another construction boss, Paolo Catania, was arrested and faces charges of fraud and conspiracy in connection with the sale of a plot of land for condo development in Montreal. The Charbonneau Commission released information last year that showed Catania and Housakos met at an exclusive Montreal club for lunch in April 2008. Another person who Housakos met at the club for breakfast, Bernard Trepanier, is also facing charges in connection with the same land deal. He's been dubbed "Mr. Three Per Cent" by the Quebec media for allegedly collecting kickbacks for Montreal's ruling party, an allegation he has denied at the inquiry. Accurso and Trepanier have both complained that the public testimony at the Charbonneau commission is impairing their chances at a fair trial. The senator's name has come up twice at the Charbonneau commission, but he had never been accused of any wrongdoing nor have the inquiry's lawyers explained why they brought him up. Housakos has said he feels he is being declared guilty by association, when he could have had no knowledge that such figures would have been engaged in alleged illegal activity. "Do I know them? Yes. Had I interacted with some of them, had I solicited for political contributions some of them? Absolutely," Housakos said. "But to insinuate that these individuals, some of them who are accused of serious crimes, are colleagues of mine again is another attempt to attach me and accuse me and make me guilty by association where it's not warranted." Jason MacDonald, a spokesman for the prime minister's office, offered a terse response to questions about Housakos and the ADQ. "Senator Housakos has denied these allegations. Questions should be directed to his office."